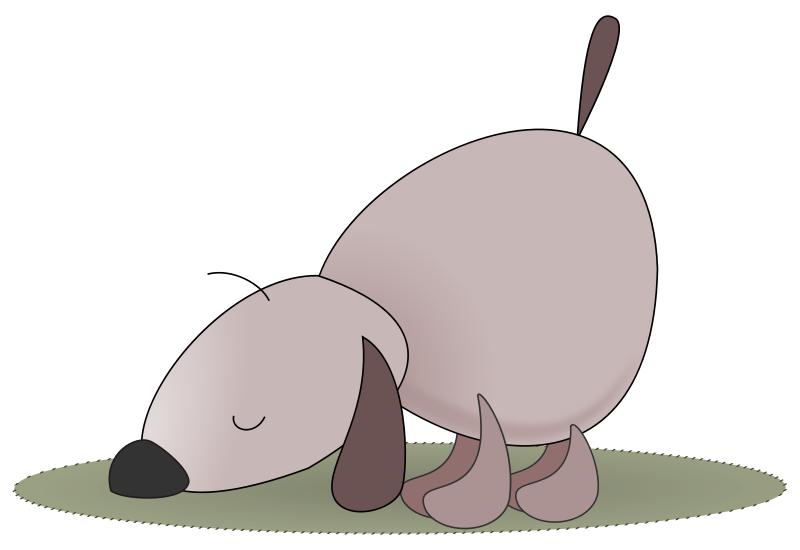 This week’s Tickle Paw Tuesday installment features a video from a senior dog rescue, Muttville, that highlights the importance of adopting senior pets. Just as there are rescue groups that cater to a specific breed, you can find amazing organizations that are putting the welfare of senior pets front and center. The next time you or someone you know is ready to add to the family, consider a senior pet. These special pets are in need of extra loving care as they shine throughout their golden years. This week’s Tickle Paw Tuesday installment is a sweet send off to summer with a video that features two adorable ferrets playing in their pool. We hope you’ve had a fun and safe summer! We, like the ferrets in this video, have just about squeezed all we can out of this summer. Are you looking forward to some cooler months ahead as we “fall” back into autumn? This week’s Tickle Paw Tuesday installment is brought to you by the current pain I am experiencing after my crown lengthening procedure today. All I wanted to do was go home, bury my face in my cat’s purring side, and mentally erase the last hour of my life. This is my version of cat therapy. I declare, if someone can/has invented silent dentistry tools, they should win a “World’s Most Awesome Person” award. However, my discomfort isn’t what I want you to remember about today. I want to tip my hat to those people and dogs who visit hospitals and nursing home facilities with the sole purpose of spreading their love and support to those who are ill, in recovery, or who are residents of a long-term care facility. These sweet therapy dogs and their amazing human counterparts can do so much for those who are frightened, sick, or lonely. Cheers to Caring Canines Therapy Dogs of Florida; we wish you years of continued success as you spread that unconditional love we all need so very much. The video highlights how easy and mutually beneficial the transference of love and comfort can be. Happy Tuesday! Be gentle with one another. 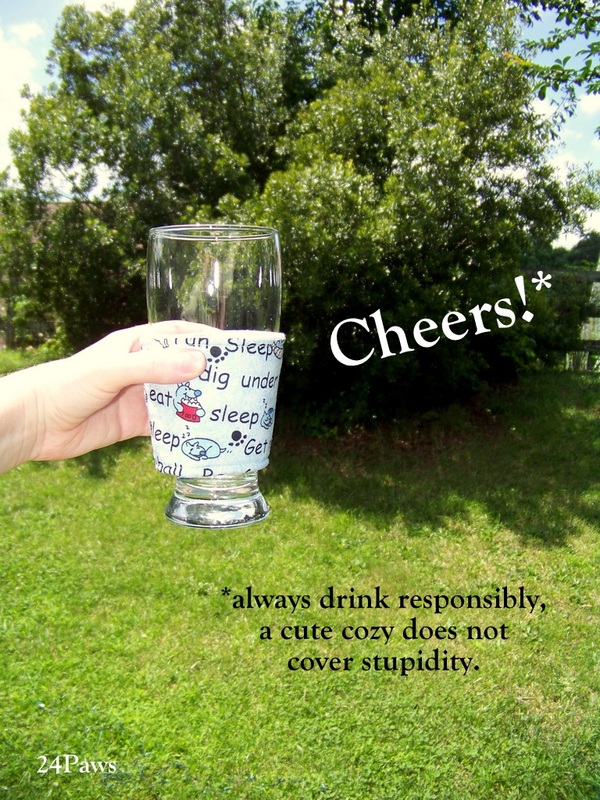 This week’s Tickle Paw Tuesday installment is part craft and remembrance—two of my favorite combinations. 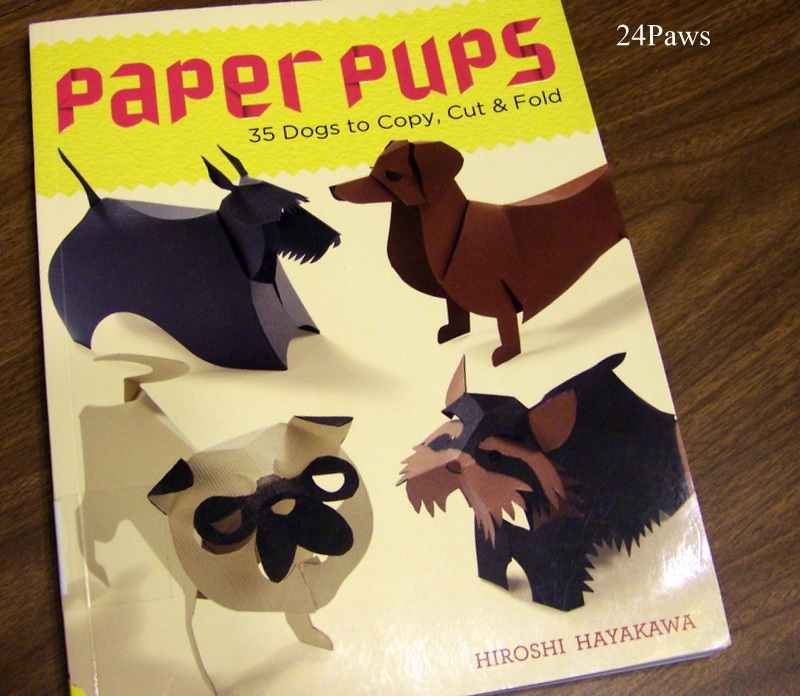 You’ll need only to score, fold, and cut the print outs you make of the templates in the book. 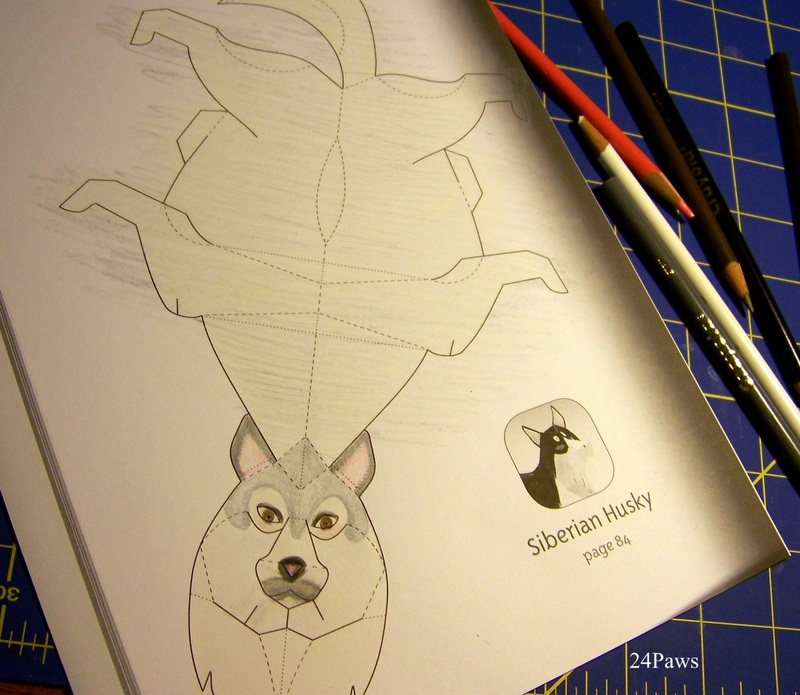 You are free to color and personalize the dogs as you see fit. You can try it out with some free projects available online at Lark Crafts. You can create a Chow Chow, Cavalier King Charles Spaniel, Schnauzer, Puli, Saint Bernard, long-hair Yorkshire Terrier, Dalmatian puppy, or the Basset Hound hat and pipe accessory set. The book is beautifully laid out, and thanks to the text and illustrations, one shouldn’t feel too overwhelmed to start the craft. 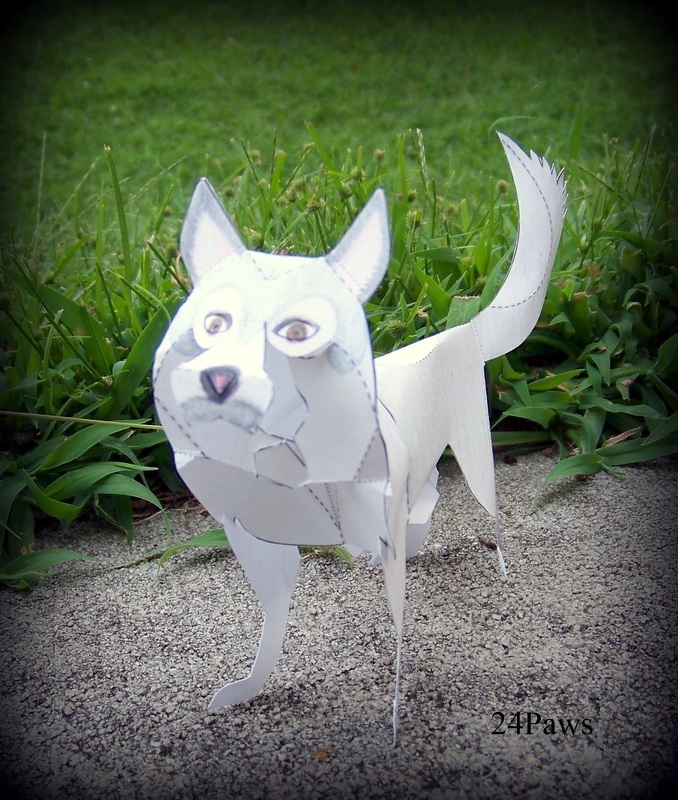 There are beginner templates to start with, but the Siberian Husky is an intermediate template. I struggled with a few folding lines, but I eventually got it. 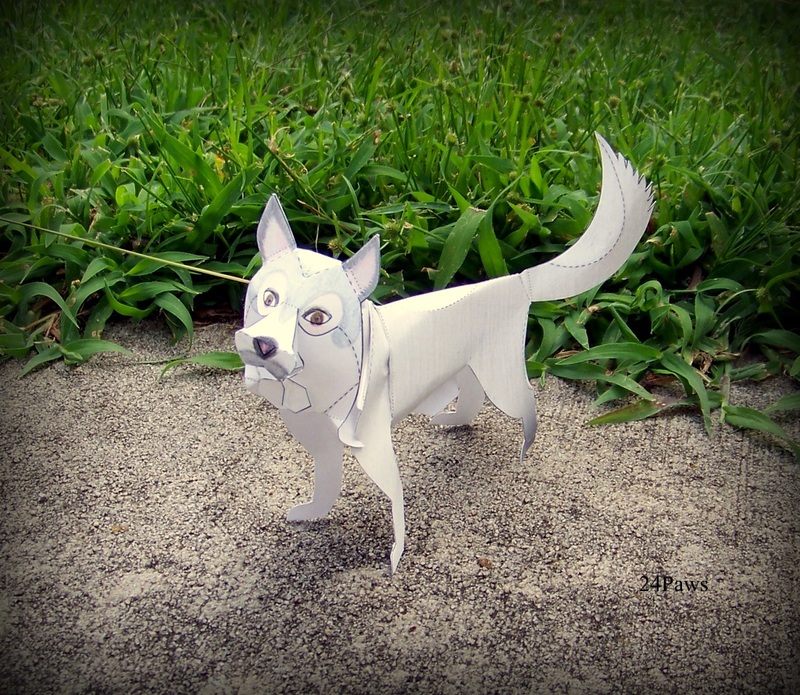 These paper crafts are not only great crafts to engage children in (with adult supervision), but they make a wonderful project to help one memorialize a pet. 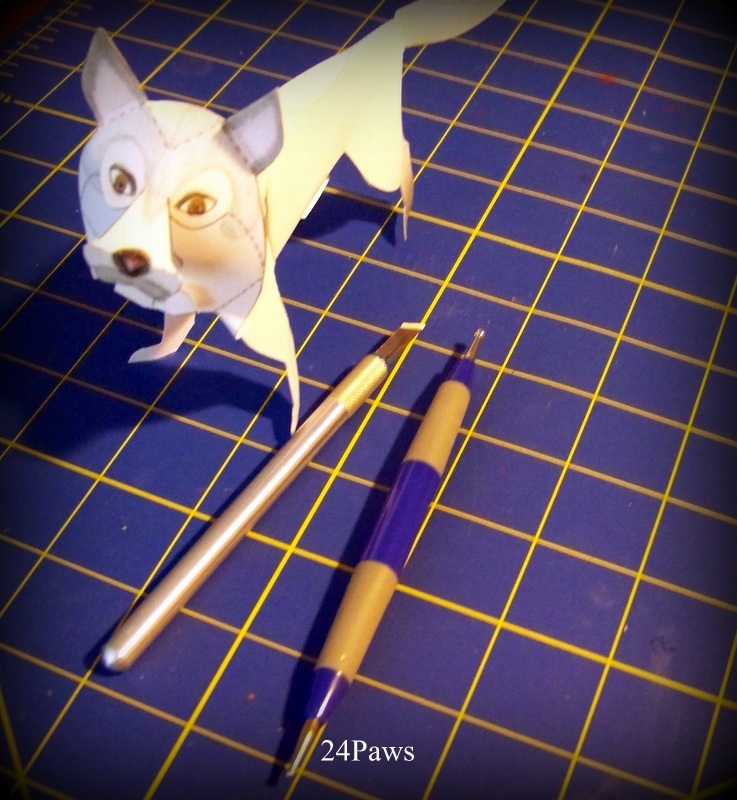 I certainly enjoyed making this little pooch. 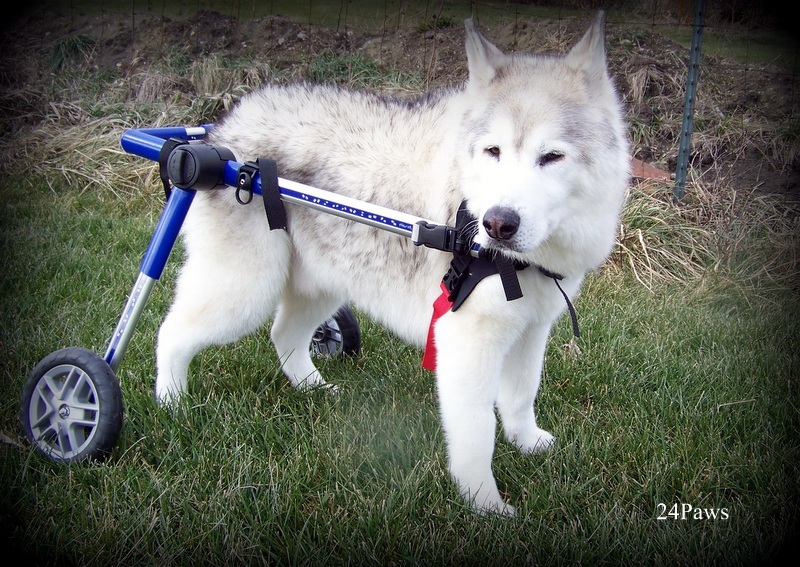 The time it takes to make one certainly provided me with the quiet concentration necessary to sit and reminisce about Tristan, our beloved Siberian Husky. The 21st of July was the three year anniversary of his death. This pencil colored miniature version does not do justice to the real deal, but he certainly makes me smile as wonderful memories are brought to the forefront of my mind. That is time well spent, I’d say. This week’s Tickle Paw Tuesday installment gets you right in the middle of kitten play time in Cat World at Best Friends Animal Society. You’ve got no excuse to virtually love these kittens, even those with allergies can safely participate. How can you resist watching kittens tumble over one another and chase their favorite toys? Yeah, I can’t think of a better way to put a smile on my face in under two minutes, either. If the summer heat and stress of life has you down, this video featuring seven beagle dogs being able to enjoy grass and sunshine for the first time in their lives is sure to bring a breeze of joy to your face. These beautiful four year old dogs have lived their entire lives in laboratory cages, being used as test subjects. The Beagle Freedom Project secured the freedom of the dogs, and the television crew from ABC affiliate WJLA tagged along to record this momentous occasion. Good luck, sweet pups, may your futures never give rise to remembrances of your past. Kudos to the Beagle Freedom Project and all of the foster families who have stepped up to take in these dogs. Made our Tuesday ten times brighter just knowing these pups are able to have their day in the sun. This week’s Tickle Paw Tuesday installment highlights the bravery of firefighters who help those who are in need of a hero, especially our animal friends who may find themselves unable to escape their burning surroundings. Find out if your local fire station is outfitted with pet oxygen masks, if not, this would be a wonderful fundraising effort for a school, rescue, or community group. Your fire department can request one kit donation from Invisible Fence through their Project Breathe Pet Oxygen Mask Donation Program. Our thoughts are with the families of the nineteen firefighters who died fighting a wildfire in Arizona on Sunday. As we near July 4th, please be careful with your celebrations, including cookouts, fireworks, and parties. Remember that your pets don’t understand what all the fuss is about and the loud noises and unfamiliar people coming in and out may be too much to handle. Keep your pets safe and give them a stress-free environment. This week’s selection for Tickle Paw Tuesday is a video that captures a keeshond puppy investigating and overcoming a newly perceived threat – a dandelion. These silly moments our dogs experience are very important lessons that help to promote confidence as they explore and learn about the world around them. This method of paws-on learning teaches them the consequences of their actions. The pup in this video doesn’t seem to mind the flavor of that fuzzy foe, but another puppy might just learn that the flower not only tastes bad, but it sticks on your nose!!! The horror! One summer we took the boys to Texas for a vacation. Just prior to heading back to Illinois, we stopped by a friend’s house for a visit. The dogs were taken off their leashes and allowed to play untethered on the 200-acre property. They didn’t know what to do with themselves or their new found freedom. We were surprised when they opted to stay at our sides. However, Frosty couldn’t contain himself when he saw something running in the distance. Our Frosty didn’t understand why his two brothers went running in the opposite direction when they saw the unknown beast. Frosty decided he must be the brave one and followed the trail of the stranger. He yelped in surprise when he found himself sprayed by the “beastly” skunk who wasn’t fond of being chased by a dog. A bath in a pond did not help his smelly situation, and his brothers did not look fondly at him during the 18 hour drive back home. I don’t know why Tristan and Grandbury didn’t follow suit and chase after Frosty. Perhaps they had a previous experience with a skunk, or maybe they had a healthier relationship with fearing the unknown. Yes, sometimes a pup, even one outside the “puppy stage” must learn the consequences of his actions. Keep them safe as they learn, and remember that some experiences are best left unknown. 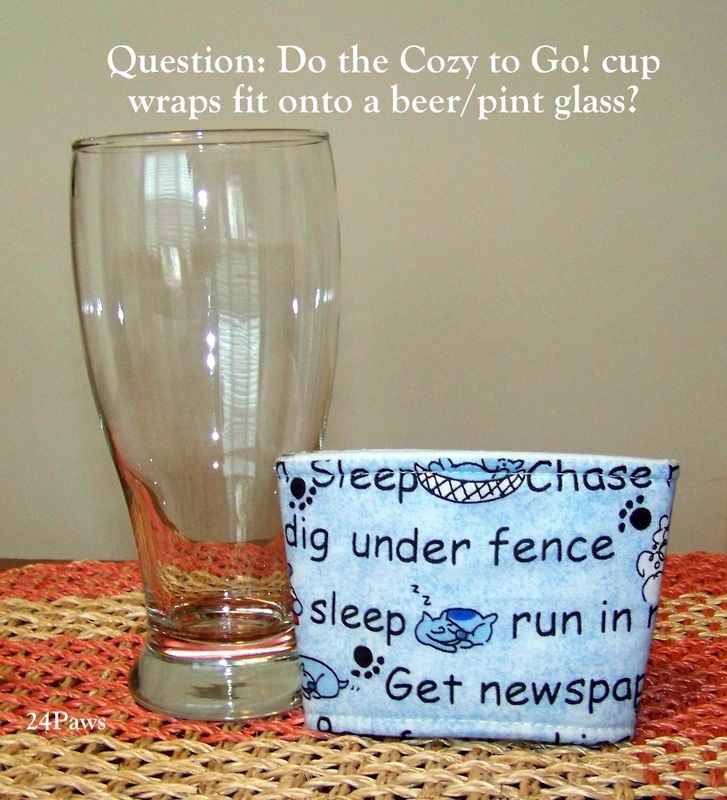 There are many variations of beer glasses on the market, so we don’t happen to know if our Cozy to Go! wraps fit all of them. The size of our Cozy to Go! 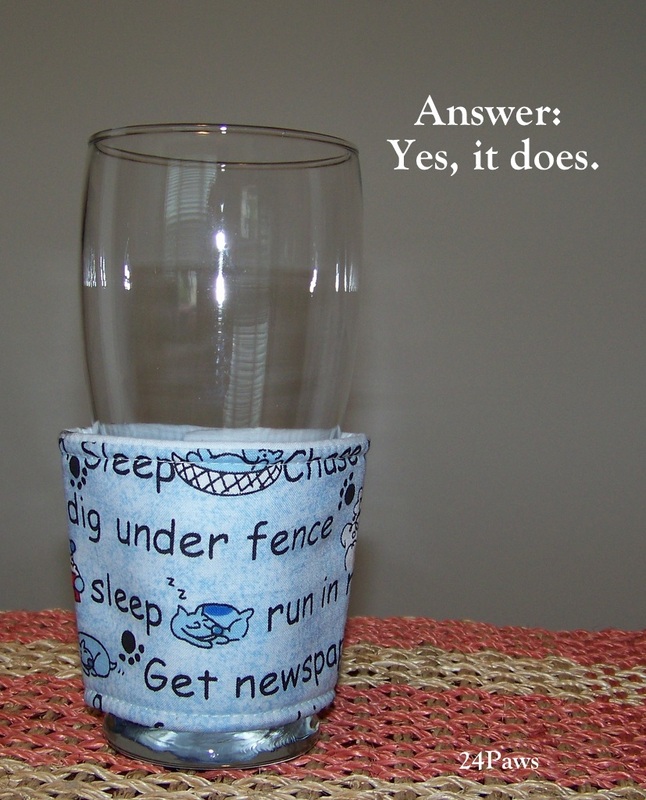 cup wraps are approximately 3” tall x 4.5” wide (folded) 9” circumference (top opening, measured from the inside). A little variance may occur due the items being handmade.